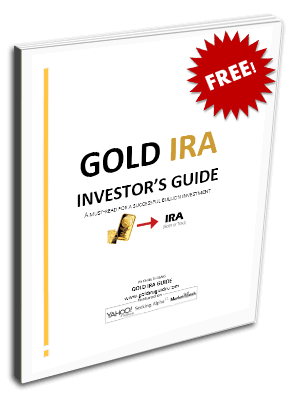 Gold IRA GuideBitcoin Are Bitcoin and Ethereum the NEW Gold and Silver? As you can see in the picture above, Bitcoin is often represented by a gold colored token. The world's second largest cryptocurrency (by market cap) Ethereum commonly has a silver token portrayal. It is no accident that the two leading digital currencies are represented by the two colors of the traditional safe havens gold and silver. This more than coincidence occurrence could just as easily be described as a sign from above. The reason for this is that Bitcoin and Ethereum have become the new technological age versions of traditional gold and silver. In only the last year, you are even able to consider Bitcoin for your IRA or 401K like with the precious metals. 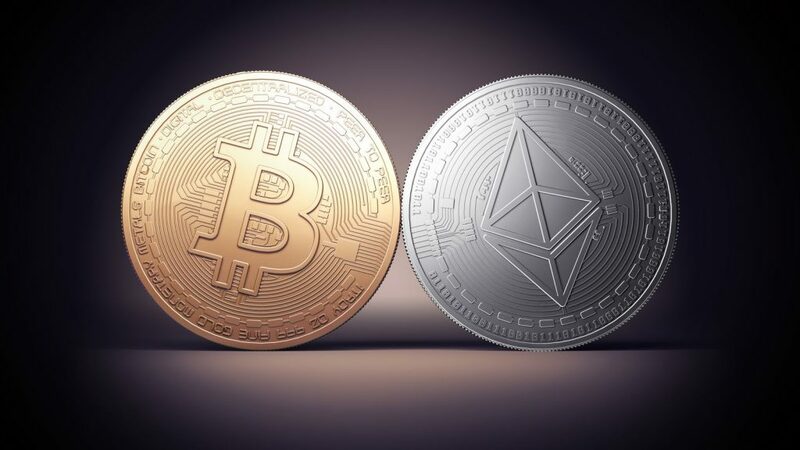 In this article, we consider the eery similarities between the two mainline cryptocurrencies and the two long-time champion, safe haven precious metals. Bitcoin is the original cryptocurrency that started the whole digital currency revolution around a decade ago. It debuted as a serious going concern back in 2009 and changed the landscape of currencies and safe haven commodities forever. In 2017, there are now over 500 varying cryptocurrencies from which interested individuals can choose, showing how successful the original pioneer in the digital currency space has truly been. Yet despite numerous attempts in the past few years to unseat it as the digital king, today's Bitcoin still commands the respect it deserves for its first mover advantage. Though the mysterious creator of Bitcoin Satoshi Nakamoto likely never intended it with his groundbreaking invention, Bitcoin proves to be so much like gold in a range of different ways. Like gold, Bitcoin may not be randomly created as with fiat currencies that the world's various central banks print at will. The two commodity currencies must be mined. Bitcoin is also rare much like the time-tested yellow metal. In fact we are nearer every day to reaching the point where all the Bitcoins which may be created on earth happens, assuming that the protocol and programming of Bitcoin is not dramatically altered to permit a bigger supply to be created one day. These features also make Bitcoin a safe haven like gold. Because the two commodities are also fixed supply currencies, the central banks and commercial banks can not simply manipulate and control them. Neither can they be arbitrarily issued. It is now more than two years since Bank of America Merrill Lynch famously claimed that Bitcoin may “emerge as a serious competitor” to cash. They were referring to its innate ability to take over the spaces of digital money transfers (ala Western Union, Money Gram, or PayPal) as well as in e-commerce transactions (like credit cards or PayPal). Since that huge endorsement and vote of confidence from the one-time largest brokerage firm in the country, Bitcoin has only grown from strength to strength. Its appeal lies in the fact that the network is both decentralized as well as peer to peer. This means that not only can it not be easily manipulated by any one or several central banks, but it also does not need any central clearinghouses or even financial institutions like the mega international commercial banks in order to process the various transactions. In order to make payments, Bitcoin customers or vendors only require Bitcoin software and a reliable Internet connection. With these two sole elements, they are able to send payments to any other public accounts. Next we will consider each of these five similarities between the king of digital currencies and the king of precious metals. Gold has managed to hold an average annual price of more than $1,000 per ounce (and even stronger than this at over $1,200 per ounce) since the time it convincingly crossed over this mark back more than a decade ago. The yellow metal has been in a longer-term bull market run since it bounced off its lows of around $200 per ounce back near the year 2000. Like with gold, enormous fortunes have been made in the Bitcoin gold rush that has been ongoing in earnest since only 2011. There have been some breathtaking ups and downs in the price movement of the new digital gold for sure. Yet the fact remains that a single bitcoin has gone from a matter of 33 cents in value only six years ago to more than double the price of an ounce of gold today. If you had invested only $100 in bitcoin in 2011, this would now be worth an astonishing over $840,000. Gold is good, and it has a 5,000 year long impressive history behind it, but it simply can not match that incredible level of price performance in any era. Gold is also a highly limited quantity that derives much of its value from the fact that “they aren't making any more of it.” With an estimated total metric tonnage of gold on the planet of 171,000 tons, there simply will not be any more gold available after this. What this comparison graphic above tells you is that there is actually far more gold on earth than there are bitcoins, especially if you are comparing ounces to BTC. The world gold supplies are estimated at nearly 377 million pounds (or 171 million kilograms). This means that even measuring Bitcoin units versus total supplies in pounds or kilograms of the yellow metal, there is far more of the old traditional gold in the world than there is the new digital gold Bitcoin. It is interesting too that both gold and Bitcoin have to be mined. Naturally with gold this process refers to physically mining it from under the earth. Bitcoins being a fully digital currency and commodity must instead be virtually mined. In practice, Bitcoin miners achieve this by decoding complex computer encryptions. This means that both safe haven currencies can not be simply printed by reckless and desperate central banks trying to “juice up” the flagging national or world economy, as this graphic below demonstrates. It is another parallel comparison between the two that it takes a huge amount of effort and energy to generate one bitcoin, just as it does to locate, unearth, and refine a single ounce of gold. It is this effort that goes into generating a Bitcoin or processing an ounce of gold that alike separates the two from paper fiat money which governments are able to create from thin air with a single keystroke. Since the old gold and the new digital one are both accepted in countries around the world, they share another common property. This is that countries which are in financial crisis or geopolitical chaos choose both gold and Bitcoin to safeguard their wealth as their home nation falls apart. Argentina is an ideal example of this argument. The South American (once enormously prosperous) country suffers from the strictest of capital controls and double digit levels of inflation. Because of this, the Argentinians have been seeking out ways to hedge what purchasing power remains to their money. An ever increasing number of them are relying on Bitcoin to effectively accomplish this wealth diversification away from the Argentinian peso and to move their wealth out of Argentina without the interference of the government. The demand is growing fast enough that one of the Bitcoin exchanges is working on opening a branch in Argentina. It is easy to see with all of the similarities between Bitcoin and gold why more and more investors are regarding Bitcoin as the new digital gold. There is a growing chorus of voices arguing that the BTC will eventually supercede both the hedging and safe haven values of the yellow metal. Only time will tell. These dramatic price moves and huge volatility swings (while trading at a significantly lower price than big brother Bitcoin) have helped to solidify this image of Ether tokens as the new silver. Yet the Ether foundation and council that manages the rising cryptocurrency has even greater ambitions for the world's second leading digital currency. As more and more exchanges and companies adopt Ether, its price has risen so dramatically that its own market cap has recently soared to higher than 50 percent of the market cap value of larger rival bitcoin. This represents a historical high in the market cap ratio comparison of the two. Consider that as recently as January 1st, Ether held under five percent of the total market cap value of Bitcoin. Still, Ether has quite a ways to go to become greater than just being the new silver. It has managed to become the first of the alt-coins to successfully challenge Bitcoin. Here is the real reason why Ethereum has become known as the new silver. Like traditional silver, Ethereum already offers more “industrial applications” than does the gold of cryptocurrencies Bitcoin. Ethereum software has made huge promises that it is already delivering on for digital “industrial” applications. It is not simply a virtual currency like Bitcoin. Ethereum offers a viable and already proven means of developing smart contracts. These are pre-programmed transactions and online markets that can automatically transact as the coded blockchain conditions become met. Consider the actual digital “industrial” applications for the new silver that are already working. Ethereum blockchain code-based programs allow for sports betting, customers to pay for and manage their electricity, questionable Ponzi schemes, and farmers to sell their own produce directly to the end using consumers. Beyond this, the majority of international banks have already shown a real interest in using the Ethereum code to create programs for faster money transfers and trading. As a concrete example of the new digital “industrial” applications, JP Morgan has already developed its own Ethereum-based tool they call Masala. It permits some of their proprietary databases to interact back and forth with Ethereum blockchains. A number of the largest names in technology such as Microsoft, Intel, and IBM are also looking at their own uses for Ether. Looking at these countless industries which are finding uses for Ethereum and digital silver Ether tokens, it really is eerily very much like traditional silver and the hundreds of applications of the gray metal. Does your investment portfolio or IRA have exposure to BTC and ETH? Does your portfolio have exposure to these cryptocurrencies? Perhaps one of the best ways to invest would be through your IRA. Ethereum is definitely on its way to be the new silver and Bitcoin the new gold. The sky may be the limit for how far and how high these two new digital safe haven commodity currencies can rise. This is why it's a good idea to consider the Top Bitcoin & Ethereum IRA companies and custodians now. As more and more companies and investors wake up to the realization of this paradigm shift in currencies and hedging commodities that the two cryptocurrencies represent, their popularity and prices will only grow as their destiny in the world of global currencies becomes assured.